The Earth’s tides weren’t always as energetic as they are today. A new study suggests that when tectonic movement molds ocean basins into certain shapes, the tides grow much stronger. And when tectonic movement opens those same basins millions of years later, the tides weaken. Credit: Creative Commons CC0. The cyclic strengthening and weakening of ocean tides over tens of millions of years is likely linked to another, longer cycle: the formation of Earth's supercontinents every 400 to 600 million years, according a new study. The new findings have implications for the formation of our planet, its climate and the evolution of life on Earth, according to the study's authors. 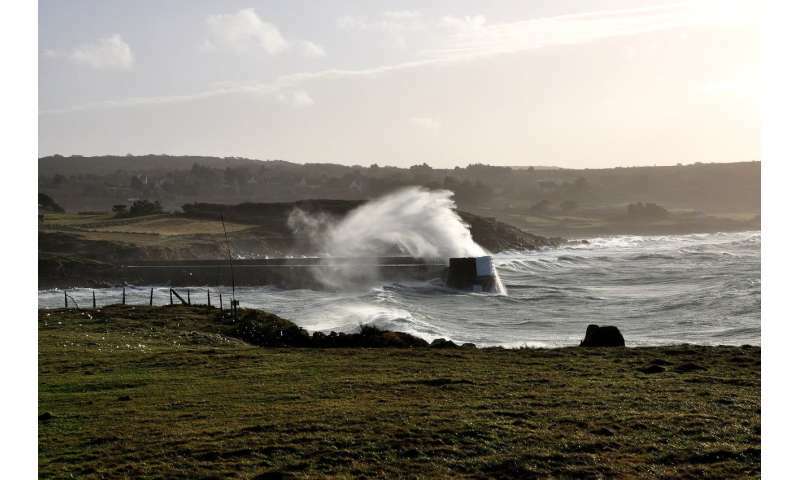 The new research suggests long-term changes in tidal energy, which control the strength of the ocean's waves, are part of a super-tidal cycle dictated by the movement of tectonic plates. When tectonic plates slide, sink and shift the Earth's continents to form large landmasses, or supercontinents, ocean basins open and close in tandem. As these basins change shape, they can strike forms that amplify and intensify their tides. In the new study, tidal simulations projected hundreds of millions of years into the future suggest the Earth is now in the nascent stage of a tidal energy maximum, where strong tides will persist for roughly 20 million years. The oceans will go through several tidal cycles as the next supercontintent forms over the next 250 million years. Eventually, the tides will grow much weaker, just as they did during the two most recent supercontinents: Pangaea and Rodinia, according to the new study published in Geophysical Research Letters, a journal of the American Geophysical Union. Scientists were aware tidal energy varied in the distant past, but the new study suggests there is a super-tidal cycle occurring over geologic timescales and linked to tectonic movement. "Our simulations suggest that the tides are, at the moment, abnormally large," said oceanographer Mattias Green from Bangor University's School of Ocean Sciences in Menai Bridge in the United Kingdom and lead author of the new study. "And that really was our motivating question: If the tides were weak up until 200 million years ago, and they've since shot up and become very energetic over the past two million years, what will happen if we move millions of years into the future?" Tidal strength is linked to life on Earth and understanding the ocean's cyclic progression stands to inform scientists' understanding of evolutionary history, according to the study's authors. In times of strong tidal energy, like today, strong waves stir the sea, creating the nutrient mixing needed to sustain ocean life. As Earth's landmasses move slowly toward a supercontinent configuration, the planet's ocean basins open, eventually forming one unbroken mass of water. Such a sea would have low tidal energy. Weak waves mean there is less nutrient mixing, which could create an oxygen-starved ocean floor largely devoid of life, much like a pool of stagnant water, according to the new study. The existence of this cycle and its link to tectonic movement stands to inform many disciplines, from evolutionary biology to global nutrient cycling, according to geophysicist Dietmar Müller from the University of Sydney in Australia, who wasn't involved in the new study. "It probably doesn't mean anything to humans now in our lifetime," Muller said. "But it does enhance our understanding of interactions between plate tectonics, Earth's climate system, its oceans, and even how the evolution of life is, at least to some extent, driven by this tidal process." Each of Earth's continents ride atop huge slabs of rock known as tectonic plates. These plates shift over hundreds of millions of years, striking different continental configurations along the way. Tectonic plates dictate the shape and arrangement of continents, but they also determine the shape of ocean basins. As the North American and Eurasian plates drift apart, the Atlantic Ocean between them widens, also changing its shape. The change in shape of ocean basins causes a change in a property known as resonance. When a basin is resonant, energy from the gravitational attraction of the moon aligns with the length of the ocean basin, causing an amplification of tidal energy. Green likens resonance to a child on a swing set. A swinging child only needs a small push from an adult, at the right timing, to keep the swing moving higher and higher. "You force it at the same frequency as the natural oscillation, and the same thing happens in the ocean," he said. In the new study, scientists simulated the movement of Earth's tectonic plates and changes in the resonance of ocean basins over millions of years. The new research suggests the Atlantic Ocean is currently resonant, causing the ocean's tides to approach maximum energy levels. Over the next 50 million years, tides in the North Atlantic and Pacific oceans will come closer to resonance and grow stronger. In that time, Asia will split, creating a new ocean basin, according to the study. In 100 million years, the Indian Ocean, Pacific Ocean and a newly formed Pan-Asian Ocean will see higher resonance and stronger tides as well. Australia will move north to join the lower half of Asia, as all the continents slowly begin to coalesce into a single landmass in the northern hemisphere, according to the new study. After 150 million years, tidal energy begins to decline as Earth's landmasses form the next supercontinent and resonance declines. In 250 million years, the new supercontinent will have formed, bringing in an age of low resonance, leading to low tidal energy and a largely quiet sea, according to the new research. The new study finds each tidal maximum lasts at most 50 million years and is not necessarily in phase with the supercontinent cycle.